Barbute helmets did not have visors, although the needs of the warrior are what dictate the evolution of the helm. This Epic Dark Visored Barbuta Helmet is as protective as a typical barbute and then-some, thanks to the visor. 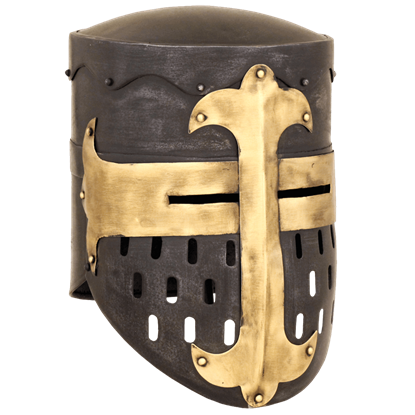 The barbute, or barbuta, was originally designed in medieval Italy, although because of how effective and useful the helmet was, it spread to other regions as well. 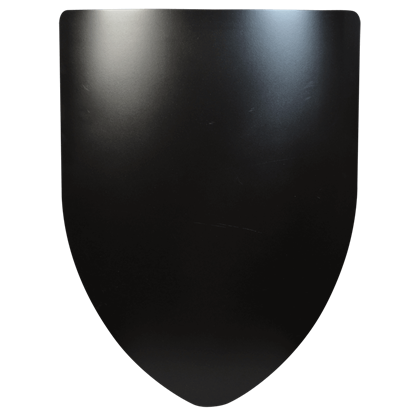 This helmet alters the typical design of a barbute by including a protective visor. 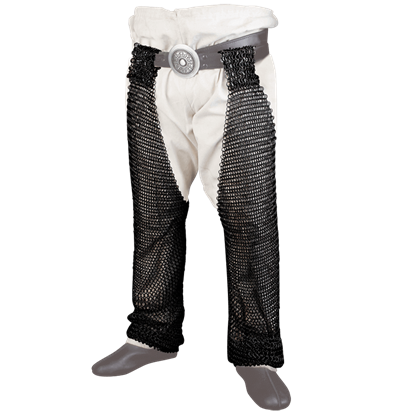 The visor is distinctive in design, possessing two rectangular eyelets, as well as a cross-shaped cut-out for air ventilation. On the right side of the helm is a small hook that latches the visor down, while the temples feature small pins and chains that secure the visor to the helmet. This means that the visor can be rotated up or to the side, or it can be removed entirely. 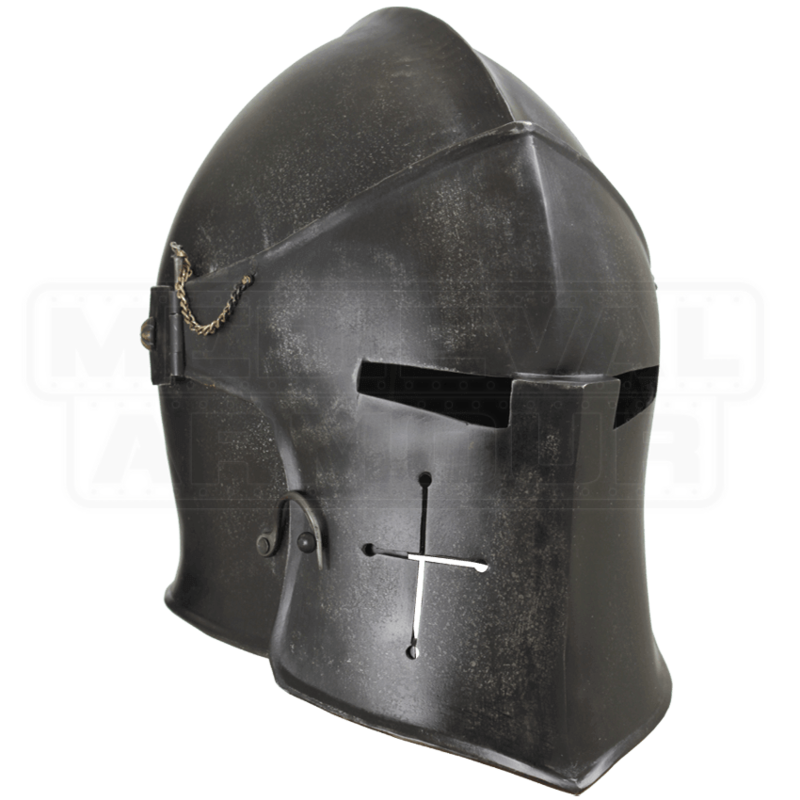 The helmet is crafted from quality steel and features an incredible looking dark metal finish, which is rust and scratch resistant. The interior of the helmet features a liner, both for comfort and for making small adjustments to size. Original barbutes might not have had visors, but the two are an ingenious combination, so much so that this Epic Dark Visored Barbuta Helmet is the kind of protection that any warrior could kill to have. This website is amazing and has many branch sites with similar merchandise. 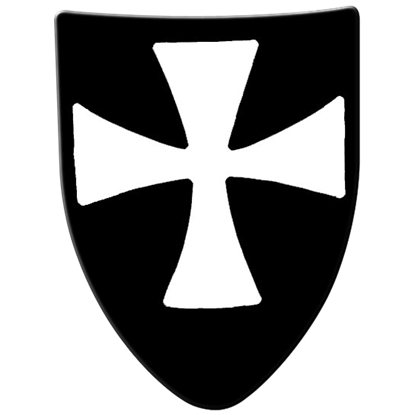 I buy most of my armor from here and am fairly pleased with everything I have gotten, speaking for both myself and others I have gifted things to. This helmet is strong and stylish. I test them myself as soon as I open them whether the product is for me or someone else. This particular helmet hasn't been blade tested yet but it survived the blunt weapons battery and has no offsets, dents, cracks, etc. 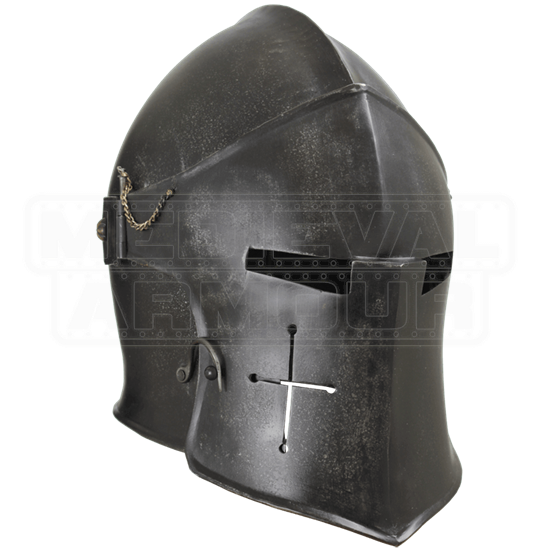 And to top it off I was fine the entire time, although I do recommend a gambeson or socktop-esk wear, I prefer the quick-clava, because this helmet is alittle bell shaped compared to the form fit look of the online pictures. So it rattles a bit when getting hit. The only thing I dnt care much for is the hinged mask, it's just a personal peeve. They survived blunt bashes but I'm willing to bet a live blade would put it in a "for training and decoration" catagory. 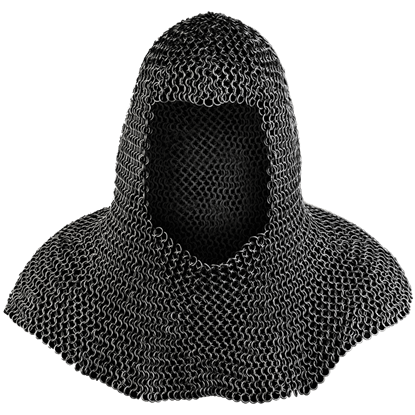 Which is why I will not be wearing it for that test as I have other helmets, shields, and armors. Overall 4/5. Great job and very pleased. Buy please post more pictures of the product the sleekness of the helmet only exists in the angled shot, favoring the helmet head on reveals its "Darth Vader-esk" quality. Very good helmet. Very solid. I can't refrain to figure out the real thing from 600 years ago might have been very similar. The only thing I see that could be improved is the pinning system that hold the facial grate into place. Whenever I turn the helmet upside down, the pins get out of the kind of hinges. This is mostly an annoyance but nothing too serious. When the helmet is where it's supposed to be (on your head) this is not a concern at all. I'm very satisfied.